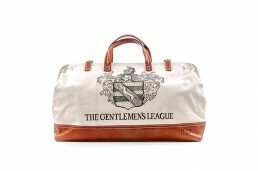 Artist Adam Krueger, known for his satirical cartoon style drawings and paintings, created this bag in homage to the re-launch of The Gentlemen’s League. 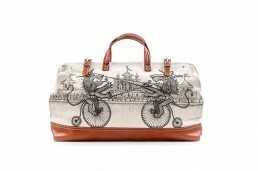 Set in a medieval castle with spectators, the front of the bag is a spoof on the new logo-showing the brand’s lions in a “friendly duel” jousting on vintage bicycles. The back of the bag shows a family crest inspired by Adam’s own family crest and the new Gentlemen’s League logo, Bag 033.